To be honest, I was completely clueless about Sicilian wine till a few weeks ago when I was invited to learn about Cusumano Winery, one of the foremost wine makers from Sicily. I was even more excited to learn that we would be pairing the wines with one of my all-time favorite food groups – pizza. And not just any pizza, Neapolitan style pizza at the popular Il Canale, which also, I had not been to prior to this! Our host was Diego Cusumano, one of the brothers behind the winery who provided insight into the workings and the story of the family business as well as background on the wines we tasted. He spoke with such passion and pride that it was easy to see how much effort and care goes into the making of their wines. A family owned winery, Cusumano started making wine in 2001 and is managed by brothers Diego and Alberto Cusumano. The family owns and operated over 1000 acres of vineyards across different parts of Sicily, and the wine produced are all 100% estate grown- meaning they don’t buy grapes from other producers. For starters we shared a sampling of Italian cured meats, vegetables, and buffalo mozzarella. It was a great start to the meal, my favorites were the amazing fresh buffalo mozzarella and the sweet roasted red peppers. Il Canale is in the heart of Georgetown and serves southern Italian food, and is especially known for their thin crust Napoletan pizzas. 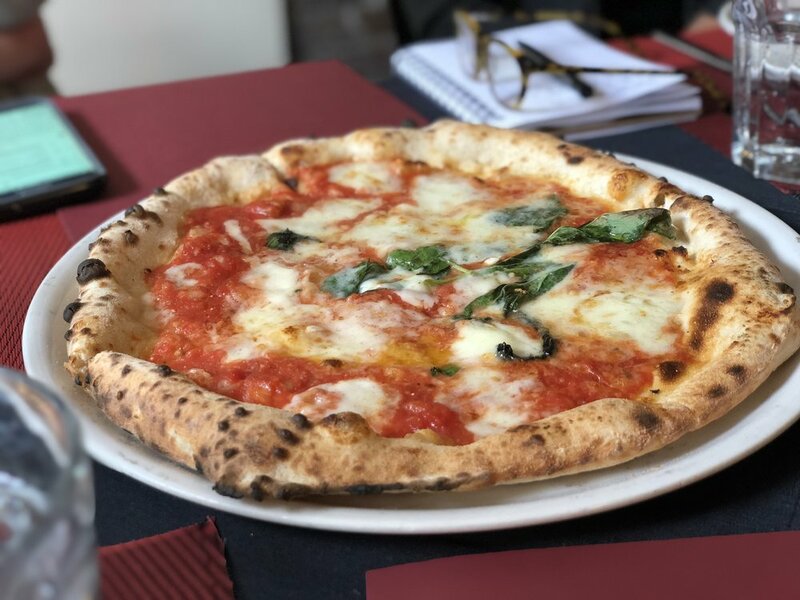 Our first pizza – a classic Margherita was paired with Cusumano’s 2016 Nero D’Avola. The Nero D’Avola is one of the most popular grape varietals of the region, and this 2016 wine really allowed the grape to come through. A deep ruby red, I thought the wine was surprisingly smooth for a 14% alcohol level, with a decent level of acidity that made it enjoyable overall. And at $12 a bottle – a steal! This would be a great example of the Nero D’avola grape and a good introduction to Sicilian wine for those who are unfamiliar with it, like me. I was also super impressed with the pizza – and then I found out that owner Joe Faruggio is a certified member of the “Veraca Pizza Napolitana” association. It basically means he is one of an elite group that meets strict requirements that respect the tradition of the art of Neapolitan pizza making. Our next pairing was the Diavola – a spicy salami topped pizza with the 2015 Cusumano Benuara. My first thought on drinking this wine was that it felt luxurious. A bold wine that paired excellently with the spicy pizza. This would be my go to if I were looking for a wine that would be able to hold up to strong, rich flavors. At around $23, this is an affordable high quality wine as well. On another note, I’m normally more of a beer drinker with pizza, but I LOVED the wine-pizza pairings and think I’m going to do more of this in general going forward. Next up was the Il Canale pie with prosciutto, eggplant, cherry tomatoes, and ricotta; paired with the 2012 Cusumano Sagana. This full bodied wine was smooth and rich, and an absolute treat. It is quite expensive at $49, so I would pick it up to save for a special occasion or a fancy dinner party. That is, if you can find it in stores as it is fairly limited in availability. We finished up with Il Canale’s “Del Pizzaiolo”, a sauce less pizza with burrata, arugula, and a mound of bresaola. This pizza was super sumptuous and elegant – and is one of the high end pizzas on Il Canale’s menu. While I preferred the previous pies that we had shared, this is the one that wowed the table. We paired it with the only white of the day – a 2016 Alta Mora Etna Bianco. Alta Mora is a new winery from the Cusumano family, and the wine is made from grapes harvested on the slopes of the active volcano, Mt. Etna. The bright yellow wine is fresh, fruity, and full bodied, and priced well at $25. Overall, I was really impressed with the Cusumano wines that we tried. Easy to drink, a variety of tastes and prices, and paired well with the delicious pizzas. I was glad to learn of Sicilian wine in general, and will definitely be keeping my eye out for more Cusumano wine!